Road trips are a cheap, easy way to travel with your family without breaking the budget. Unlike airplanes, you don’t have the long wait time at the airport and more importantly, you will have a car to use at your destination without worrying about having to loan a car seat. There are horror stories about car rental companies that provide old, expired car seats for rental. The problem with renting a car seat is that you have no idea whether those seats have already been in an accident and are no longer safe to use. There are of course several ways. You could play happy songs on the car radio, if there are two or more of you, you could have one person sit at the back and amuse your baby, or you could buy your baby some toys to play with. Out of these options, the last one is probably the least exhausting one for you. There are some car seat toys that we love better than others. Here are our favorite 5 baby car seat toys. 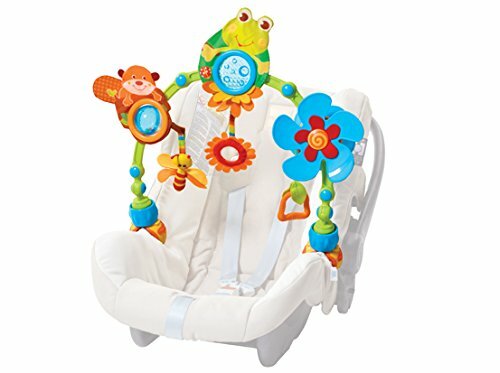 This car seat toy is specially designed to keep babies happy in car seats. It is clipped onto the sides of a car seat to provide a hanging arch. 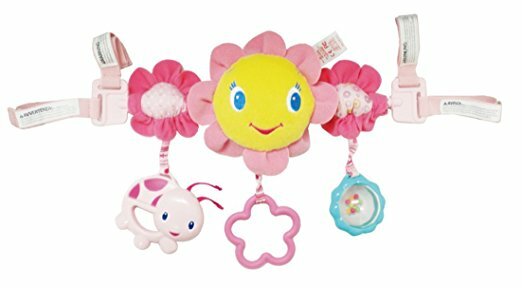 The hanging arch has engaging toys on it including a spinning bead ball, a frog that crinkles, a flower mirror, a teether and baby-activated propeller. The arch can be adjusted to be closer or further away from your baby so that you can control the amount of stimulation. This also allows you to adjust the arch closer to your baby when he or she is first learning how to bat at the toys and once he or she has a better grasp, you can angle the arch further away to encourage your baby to reach with outstretched hands. These toys are designed to provide sensory exploration and the baby-activated propeller will teach your baby about cause and effect. The bonus about this toy is that the clip is flexible enough to be used on most types of strollers and bassinets as well. But the best part about this toy is that your baby can’t accidentally drop it or lose it while sitting in the car seat. This toy is also BPA and phthalates-free. 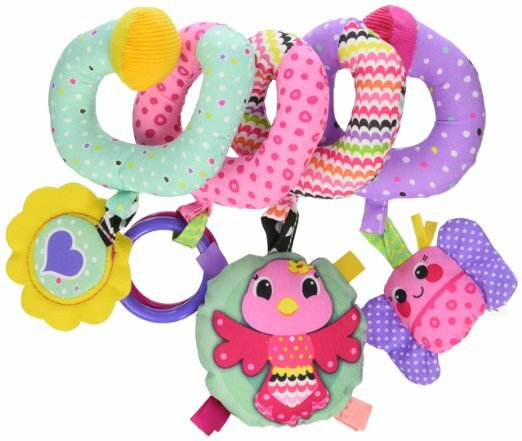 The Infantino Spiral Activity Toy is designed to fit easily into most car seats, strollers and cribs. You attach it by wrapping it around a car seat handle or anything that is long and not too wide. This means that you could choose where you want to hang this toy. You could hang it on the top of the car seat handle or on the sides…this design gives you a bit more flexibility. If you choose to use this toy as a crib toy too, it will probably help to provide your baby some recognition of familiarity and comfort. This toy comes with a mirror, 2 clacker rings, a bird rattle and a bug that makes crinkly noises. It also has different textures and satin ribbons for your baby to pull on. This car seat Toy Bar uses Velcro strips so it attaches easily to anything with a handle. This makes it versatile enough to be used on many types of car seats or anything with an overhanging handle. What makes this toy bar stand out is that it plays music- which is a huge plus. There is a spinning roller ball with rattle beads in it, a spinning mirror and the centerpiece of an owl has a flashing heart that lights up and plays 4 cheerful melodies when pressed. This Toy Bar is less likely to overstimulate a child as it is less elaborate but it still works for keeping a baby engaged for a while. Again, we love that baby can’t throw it out of the car seat. 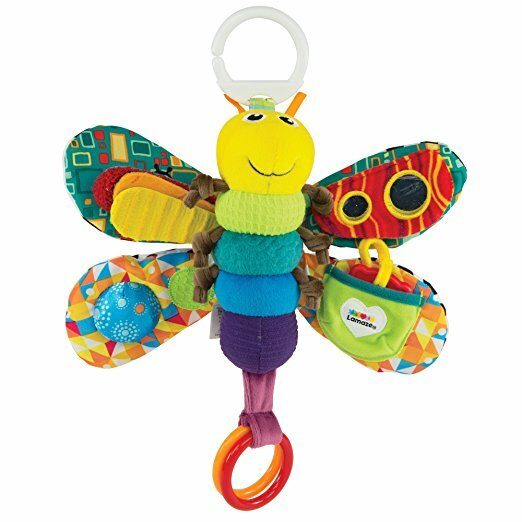 The Lamaze Firefly is another great baby car seat toy. You can attach it securely to the car seat handle and baby plays with it when he or she wants to. It’s especially good for sensory growth as it has bright strong colors and materials with different textures. The wings crinkle and one also has a mirror on it. 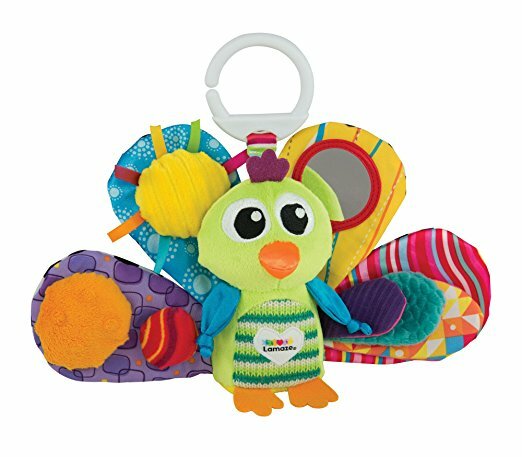 The Lamaze Freddie also makes sounds when touched including clacking, squeaking and jingling when shaken. There is also a pull out teether attached to one of the wings. This may seem like a simple toy but it is well thought-out and we are amazed at how much children are attracted to it! The toy is also BPA-free. Lamaze Peacock is very similar to Lamaze Freddie, only that it is a cute peacock instead of a firefly. It also comes with a variety of textures including crinkly material and soft textures. The peacock is brightly-colored and has wings that are great for a teething baby. The back of the peacock’s feathers have strong black and white contrasting patterns for visual development. The toy has a rattle sound and also a squeaker for auditory stimulation. This toy also has a mirror and tags on it for babies who love pulling on stuff. This toy is also BPA-free. In addition to getting a few good car seat toys for your baby, you should aim to stop when your baby is awake to give your baby a chance to stretch and get out of the car. So when the baby is awake, take a rest stop, get some food to eat, head to the bathroom, let your baby enjoy being out of the car for a while. In this way, hopefully, the stimulation will tire baby out and when you get back on the road, the baby will happily fall asleep. This also means that while the baby is sleeping, you should keep driving and get in as many miles as you can! Drive to suit your baby and you will have a much happier journey.